Definition at line 152 of file CEvent.h. Definition at line 155 of file CEvent.h. Definition at line 238 of file CEvent.cpp. References CKeyFactory::add(), CCopasiRootContainer::getKeyFactory(), CCopasiObject::getObjectType(), initObjects(), and CAnnotation::mKey. Definition at line 257 of file CEvent.cpp. References CKeyFactory::add(), CCopasiRootContainer::getKeyFactory(), CAnnotation::getMiriamAnnotation(), CCopasiObject::getObjectType(), initObjects(), CAnnotation::mKey, and CAnnotation::setMiriamAnnotation(). Definition at line 278 of file CEvent.cpp. References CCopasiRootContainer::getKeyFactory(), CAnnotation::mKey, mpDelayExpression, mpPriorityExpression, mpTriggerExpression, pdelete, and CKeyFactory::remove(). Definition at line 346 of file CEvent.cpp. 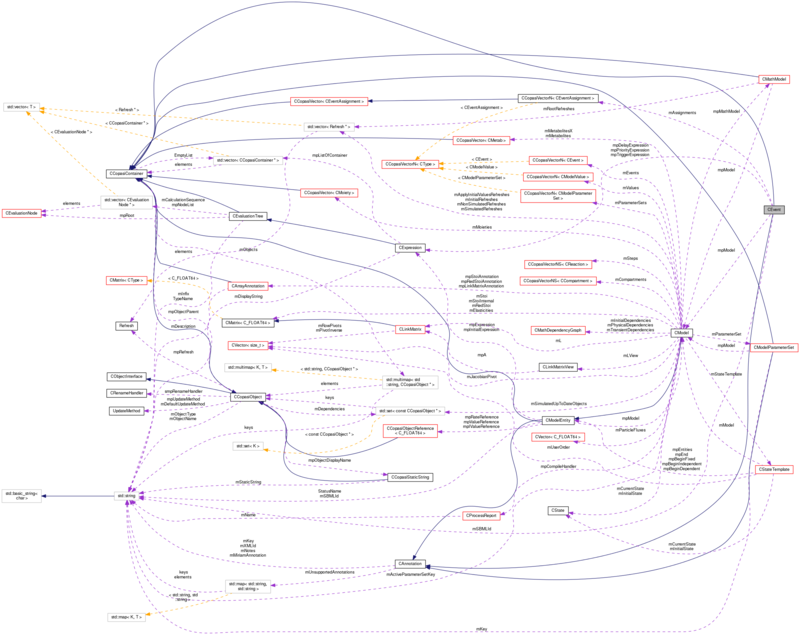 References CCopasiObject::addDirectDependency(), CCopasiVector< T >::begin(), CCopasiObject::clearDirectDependencies(), CExpression::compile(), CCopasiVector< T >::end(), mAssignments, mpDelayExpression, and mpTriggerExpression. 350 // Clear the old direct dependencies. Delete assignment with the given key. Please note this is not the target key. Definition at line 688 of file CEvent.cpp. References CKeyFactory::get(), CCopasiRootContainer::getKeyFactory(), and mAssignments. Definition at line 678 of file CEvent.cpp. Referenced by CModelAdd::addEvents(), CMathEventN::allocate(), CMathEventN::compile(), CMathEvent::compile(), CModel::convert2NonReversible(), CQEventDM::data(), CModelExpansion::duplicateEvent(), SBMLImporter::importEvent(), CSBMLExporter::isEventSBMLCompatible(), CQEventWidget1::loadFromEvent(), SBMLImporter::removeUnusedFunctions(), CModelExpansion::replaceInEvent(), CCopasiXML::saveModel(), CQEventWidget1::saveToEvent(), and CCopasiXMLParser::AssignmentElement::start(). Definition at line 683 of file CEvent.cpp. Retrieve whether to delay the calculation of the assignment. Definition at line 419 of file CEvent.cpp. Referenced by CModelAdd::addEvents(), CMathEventN::compile(), CMathEvent::compile(), CSBMLExporter::createEvent(), CQEventDM::data(), CModelExpansion::duplicateEvent(), CQEventWidget1::loadFromEvent(), CCopasiXML::saveModel(), and CQEventWidget1::saveToEvent(). Retrieve the expression of the delay as a string. Definition at line 591 of file CEvent.cpp. References CEvaluationTree::getInfix(), mpDelayExpression, and CExpression::updateInfix(). Referenced by CMathEventN::compile(), CMathEvent::compile(), CModel::convert2NonReversible(), CQEventDM::data(), CModelExpansion::duplicateEvent(), CQEventWidget1::loadFromEvent(), CCopasiXML::saveModel(), and CQEventWidget1::saveToEvent(). Retrieve the pointer to the expression of the delay. Definition at line 606 of file CEvent.cpp. Referenced by CModelAdd::addEvents(), CModelAdd::copyDelayExpression(), CQEventDM::data(), CModelExpansion::duplicateEvent(), CSBMLExporter::isEventSBMLCompatible(), SBMLImporter::removeUnusedFunctions(), and CModelExpansion::replaceInEvent(). Definition at line 601 of file CEvent.cpp. Retrieve whether the trigger may fire at the initial time. Definition at line 429 of file CEvent.cpp. Referenced by CMathEventN::compile(), and CCopasiXML::saveModel(). Definition at line 287 of file CEvent.cpp. Referenced by CModelExpansion::duplicateEvent(), CCopasiXMLParser::EventElement::end(), CQEventDM::insertRows(), CCopasiXML::saveModel(), CQEventDM::setData(), and CSBMLExporter::updateMIRIAMAnnotation(). Definition at line 464 of file CEvent.cpp. References CCopasiObject::getObjectAncestor(), CCopasiObject::getObjectDisplayName(), and CCopasiObject::getObjectName(). Retrieve whether the trigger must remain true between firing and executions. Definition at line 439 of file CEvent.cpp. Retrieve the expression of the priority as a string. Definition at line 658 of file CEvent.cpp. References CEvaluationTree::getInfix(), mpPriorityExpression, and CExpression::updateInfix(). Referenced by CMathEventN::compile(), and CModel::convert2NonReversible(). Retrieve the pointer to the expression of the priority. Definition at line 668 of file CEvent.cpp. Definition at line 673 of file CEvent.cpp. Definition at line 403 of file CEvent.cpp. Referenced by CSBMLExporter::collectIds(), CSBMLExporter::createEvent(), CSBMLExporter::exportEventAssignments(), and CCopasiXML::saveModel(). Retrieve the expression of trigger as a string. Definition at line 524 of file CEvent.cpp. References CEvaluationTree::getInfix(), mpTriggerExpression, and CExpression::updateInfix(). Referenced by CMathEventN::CTrigger::allocate(), CMathEventN::CTrigger::compile(), CModel::convert2NonReversible(), CQEventDM::data(), CModelExpansion::duplicateEvent(), CQEventWidget1::loadFromEvent(), CCopasiXML::saveModel(), and CQEventWidget1::saveToEvent(). Retrieve the pointer to the expression of trigger. Definition at line 534 of file CEvent.cpp. Referenced by CModelAdd::addEvents(), CMathEvent::compile(), CModelAdd::copyTriggerExpression(), CQEventDM::data(), CModelExpansion::duplicateEvent(), CSBMLExporter::isEventSBMLCompatible(), SBMLImporter::removeUnusedFunctions(), and CModelExpansion::replaceInEvent(). Definition at line 539 of file CEvent.cpp. Definition at line 699 of file CEvent.cpp. Definition at line 380 of file CEvent.cpp. Definition at line 293 of file CEvent.cpp. References CCopasiVector< T >::begin(), CCopasiVector< T >::end(), mAssignments, mpDelayExpression, mpPriorityExpression, and mpTriggerExpression. Set whether the calculation or the assignment shall be delayed. Definition at line 408 of file CEvent.cpp. References mDelayAssignment, mpModel, and CModel::setCompileFlag(). Referenced by CModelAdd::addEvents(), CModelExpansion::duplicateEvent(), SBMLImporter::importEvent(), CQEventWidget1::saveToEvent(), and CCopasiXMLParser::EventElement::start(). Set the expression of delay from a string. The return value indicates if parsing the expression was successful. Definition at line 544 of file CEvent.cpp. References CEvaluationTree::getInfix(), mpDelayExpression, mpModel, CModel::setCompileFlag(), and CExpression::setInfix(). Referenced by CModel::convert2NonReversible(), CModelAdd::copyDelayExpression(), CModelExpansion::duplicateEvent(), CCopasiXMLParser::EventElement::end(), and CQEventWidget1::saveToEvent(). Set the expression of delay from an expression. Definition at line 558 of file CEvent.cpp. References CCopasiContainer::add(), CExpression::compile(), mpDelayExpression, mpModel, pdelete, CModel::setCompileFlag(), CCopasiObject::setObjectName(), and CCopasiObject::setObjectParent(). Set whether the trigger may fire at the initial time. Definition at line 424 of file CEvent.cpp. Definition at line 444 of file CEvent.cpp. 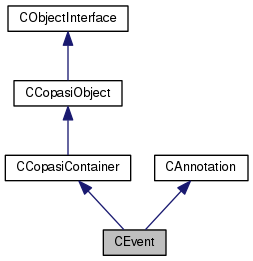 References CCopasiObject::getObjectAncestor(), CCopasiObject::getObjectParent(), mpModel, CModel::setCompileFlag(), and CCopasiObject::setObjectParent(). Set whether the trigger must remain true between firing and executions. Definition at line 434 of file CEvent.cpp. Set the expression of priority from a string. The return value indicates if parsing the expression was successful. Definition at line 611 of file CEvent.cpp. References CEvaluationTree::getInfix(), mpModel, mpPriorityExpression, CModel::setCompileFlag(), and CExpression::setInfix(). Set the expression of priority from an expression. Definition at line 625 of file CEvent.cpp. References CCopasiContainer::add(), CExpression::compile(), mpModel, mpPriorityExpression, pdelete, CModel::setCompileFlag(), CCopasiObject::setObjectName(), and CCopasiObject::setObjectParent(). Definition at line 398 of file CEvent.cpp. Set the expression of trigger from a string. The return value indicates if parsing the expression was successful. Definition at line 474 of file CEvent.cpp. References CEvaluationTree::getInfix(), mpModel, mpTriggerExpression, CModel::setCompileFlag(), CExpression::setInfix(), and CExpression::setIsBoolean(). Referenced by CModel::convert2NonReversible(), CModelAdd::copyTriggerExpression(), CMathContainer::createDiscontinuityDataEvent(), CCrossSectionTask::createEvent(), CModelExpansion::duplicateEvent(), CCopasiXMLParser::EventElement::end(), and CQEventWidget1::saveToEvent(). Set the expression of trigger from an expression. Definition at line 491 of file CEvent.cpp. References CCopasiContainer::add(), CExpression::compile(), mpModel, mpTriggerExpression, pdelete, CModel::setCompileFlag(), CCopasiObject::setObjectName(), and CCopasiObject::setObjectParent(). Definition at line 704 of file CEvent.cpp. Referenced by CMathContainer::createDiscontinuityDataEvent(), and CCrossSectionTask::createEvent(). Definition at line 388 of file CEvent.cpp. A vector assignments expressions which specify the changes made by the event. Definition at line 417 of file CEvent.h. Referenced by compile(), deleteAssignment(), getAssignments(), and mustBeDeleted(). A Boolean flag indicating whether the calculation or the assignment should be delayed in the case that a delay is present. Definition at line 423 of file CEvent.h. Referenced by getDelayAssignment(), and setDelayAssignment(). Definition at line 429 of file CEvent.h. Referenced by getFireAtInitialTime(), and setFireAtInitialTime(). Definition at line 445 of file CEvent.h. Referenced by compile(), getDelayExpression(), getDelayExpressionPtr(), mustBeDeleted(), setDelayExpression(), setDelayExpressionPtr(), and ~CEvent(). A Boolean flag indicating whether the trigger expression must remain true between firing and executing the event. Definition at line 435 of file CEvent.h. Referenced by getPersistentTrigger(), and setPersistentTrigger(). Definition at line 412 of file CEvent.h. Referenced by initObjects(), setDelayAssignment(), setDelayExpression(), setDelayExpressionPtr(), setObjectParent(), setPriorityExpression(), setPriorityExpressionPtr(), setTriggerExpression(), and setTriggerExpressionPtr(). Definition at line 450 of file CEvent.h. Referenced by getPriorityExpression(), getPriorityExpressionPtr(), mustBeDeleted(), setPriorityExpression(), setPriorityExpressionPtr(), and ~CEvent(). Definition at line 440 of file CEvent.h. Referenced by compile(), getTriggerExpression(), getTriggerExpressionPtr(), mustBeDeleted(), setTriggerExpression(), setTriggerExpressionPtr(), and ~CEvent(). The id of the corresponding event in an SBML file. This value is either set upon importing an SBML file, or when the object is first exported to an SBML file. Definition at line 462 of file CEvent.h. Referenced by getSBMLId(), operator<<(), and setSBMLId(). Definition at line 455 of file CEvent.h.